Directed by Distinguished Fellow Lowry Burgess, this project aims to broaden and create opportunities for artists to engage with and participate in the pursuit of space travel and exploration. 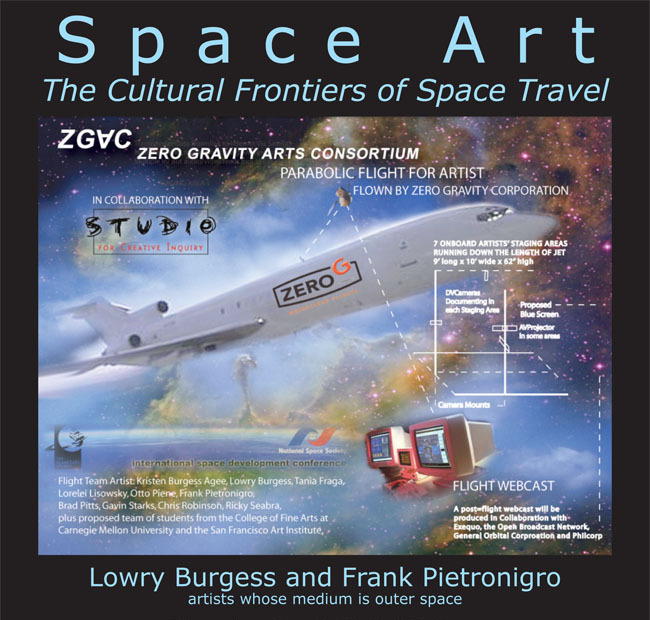 There is a particular focus on zero gravity flights for artists through the establishment of an organization named the Zero Gravity Arts Consortium. Project activities also include exhibits, conference papers, workshops, publications, reports, classes, peer group meetings, lectures, journal articles and art works. The audience includes artists, scientists, technologists, educators and the general public. In April 2008, Burgess and collaborators Vashti Germaine, Andrew Kaiser, Jonathan Minard, Frank Pietronigro and Franco Sciannameo unveiled “I See the Earth and It Is Beautiful” at Yuri’s Night, an art, science and music celebration in the San Francisco Bay Area. This project linked the audience with the International Space Station in a tribute to our global space heritage. The current focus is on a suite of participatory artworks that will be transported to the Moon in December 2012 aboard Carnegie Mellon University’s experimental lunar rover in collaboration with the Robotics Institute and Astrobotic Technology Inc.